I had to have a go at this - I just felt the size of the original was wrong for me and I didn't like too much empty space in the middle and around the top. So here it is, I've tried to keep the shape as much as possible and just made everything smaller. The centre ring is now only 20 ds (10-10), instead of 34 which is easily workable and much more pleasant to handle. I also think the two centre rings (it's actually a ring and a chain around it) fit better together whereas on the larger version, I was struggling to get it to fit really evenly all around (as you can see on the second photo). Here's the two together, for comparison's sake. to get it a bit rounder. I like both versions, although the scaled down version looks more do-able for me. I like the scaled down version more. 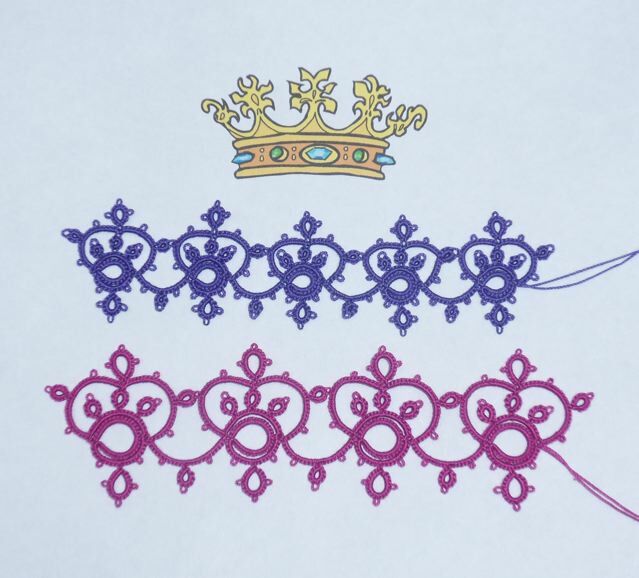 It's really lovely but I think you're right, you need more ds on the crown curve for that stereotypical crown shape. I still think this would be very popular with young "princesses". I like both versions! Each could be "just right" for some project. I really admire those of you that can rework patterns to your liking - someday I will be able to do that too! Gotta say - I love the original one. I find it very pleasing. You re probably right to say the scaled down one is easier to manage, however! I like the roundness of the original, so perhaps once you add more ds's to the crown of the smaller version, it will look as nice. Orsi and I agree, both are beautiful! 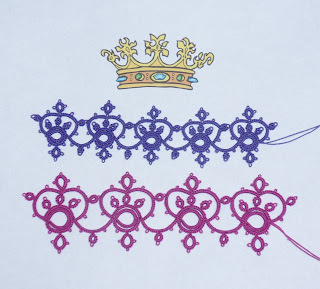 And now I want to tat a crown edging fora little Prince! Die Krone ist wunderbar in Occhi umgesetzt. Deine Arbeit sieht sehr gut aus.